Angharad has a passion for working with young people and children. As an experienced youth worker as well as dancer Angharad has project managed and delivered many interesting projects with young people. Her experience ranges from working with mother and toddler groups in rural Wales to inner city inclusion projects in Leicester. Angharad has been invited to teach dance sessions at Escola Nova, Rio de Janeiro and Pirez Gyerekmuhely, Budapest. 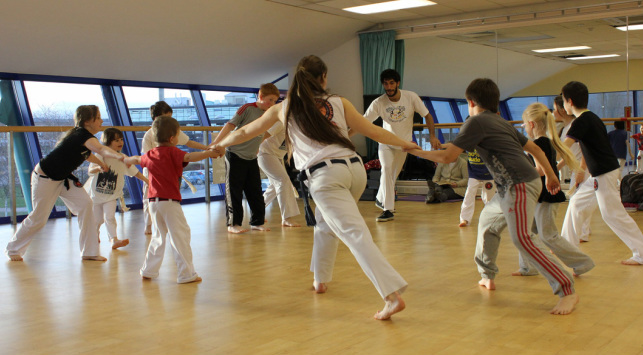 As well as delivering dance projects and workshops, Angharad is the Instructor for Capoeira Senzala Cymru where she teaches children from 3 years old up to adults. Since 2010 Angharad has been developing her skills teaching within higher education. She currently holds a posts as Lecture in Dance at The Universuty of Chester and has previously taught at Edge Hill University, Ormskirk and De Montfort University, Leicester. In 2010 she was awarded a JISC RSC East Midlands - Learning Technology Award, for her research into the use of virtual learning environments in the acquisition of dance technique. "Such a brilliant session! Your passion really comes across when you teach and the young people really enjoyed themselves and learnt a lot at the same time!" Youth Worker, Llanfyllin Youth Club.